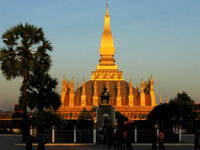 That Luang Stupa is a symbol of Buddhism and Lao rule, and is the country's most important religious building. The golden temple and its spire are visible from afar, and are an unforgettable welcoming sight for travellers. King Setthathirath built the shrine in 1566 and his statue stands in front of the temple, where the setting sun enhances the beauty of its already stunning golden surface. The central stupa is deeply symbolic. Resembling a curved lotus bud, its three tiers represent different aspects of Buddhism. More specifically, the base deals with hell, the middle revolves around 30 Buddhist teachings and the top tier is about heaven. Visitors should explore the area with a local guide, who can explain the site's significance. They will also need to dress modestly, covering their knees and shoulders. Women can borrow traditional Lao skirts at the entrance. Regarding fees, visitors must pay to access the base of the stupa, while access to the Reclining Buddha and surrounding temples is free. Opening times: Tuesday - Sunday: 8am to 12pm; 1pm to 4pm. Closed on Mondays.